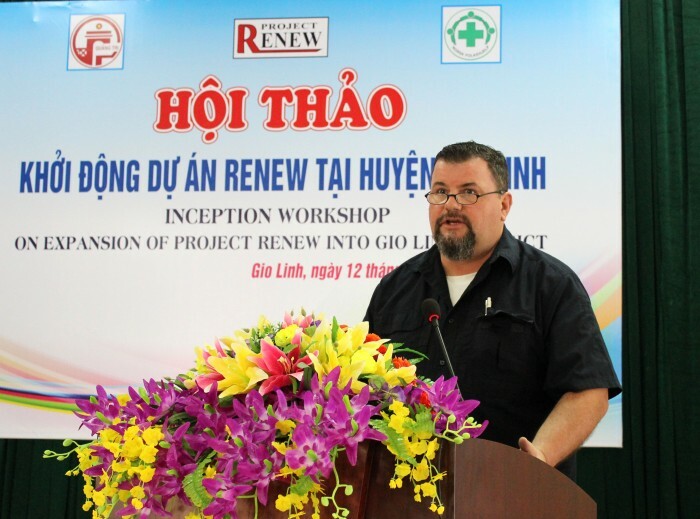 Magnus Johansson from NPA Viet Nam speaking at the workshop expanding UXO survey and clearance operations into Gio Linh District. 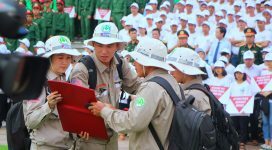 Gio Linh, Quang Tri (12 May 2016) — Once part of the McNamara Line and a corner of what became known as Leatherneck Square where some of the heaviest fighting of the Vietnam War was fought, Gio Linh District has now been included in RENEW’s humanitarian mine action in partnership with Norwegian People’s Aid, after an inception workshop was held today at the office of District People’s Committee. The goal of the expansion is to make Gio Linh, straddling the southern side of the former Demilitarized Zone (DMZ), safe through identification of areas that are contaminated with cluster bombs and other explosives for targeted follow-up clearance. The workshop was attended by representatives from Quang Tri Department of Foreign Affairs, Provincial Military Command, Legacies of War Coordination Center (LWCC), District People’s Committee, Bureaus of Labor, Invalids and Social Affairs, Farmers’ Union, Women’s Union, Red Cross Association, People with Disabilities Association, Education, Youth Union and Natural Resources and Environment. 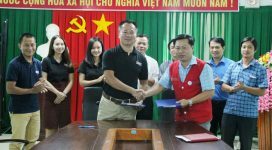 Other participants were representatives from People’s Committee of 21 communes in Gio Linh District, Project RENEW, NPA Vietnam and Mine Advisory Group (MAG). More than forty years after the war ended, UXO still poses a threat to the safety of local people of Gio Linh. 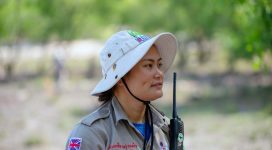 According to the LWCC’s database, Gio Linh has sustained the third highest number of UXO casualties in Quang Tri Province. 1,191 people have been killed and injured since 1975. In June 2015, an explosion of a naval shell killed a 42-year-old man, father of three young children, in Trung Son Commune. The victim had engaged in scavenging scrap metal for several years. Under the endorsement of the provincial government, in partnership with NPA, Project RENEW will deploy Explosive Ordnance Disposal (EOD) teams to provide quick response to UXO sightings reported by local people through the community reporting network already established among Youth Union members and school teachers. Technical survey teams will work to map contaminated areas that need clearance based on starting points that have been identified by non-technical surveyors since March 2016.